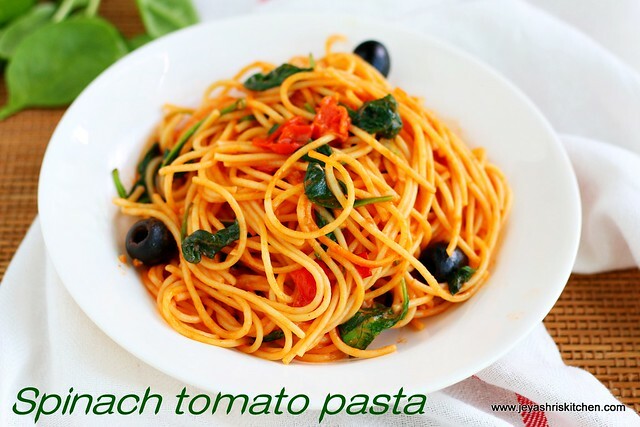 Creamy spinach tomato pasta made with spaghetti pasta. Two days back, when I and Varsha were browsing in Pinterest, found many interesting vegetarian pasta recipes. We both decided to go for the spinach tomato pasta after browsing lot of recipes. After seeing many recipes in that category, we both come up with our own recipe, which sounded so easy for me to try it out too. I have a box of cute baby spinach recipes, which i got from Fairprice. I made this for my lunch today and reserved a portion for Varun too and he had the pasta after coming back from school. Varsha couldn't taste this as she went to her friend's house today. But i promised her that i will make this again for her tomorrow. Make this simple delicious creamy spinach pasta and enjoy your meal. Check out my other pasta recipes. *I used 1 cup of baby spinach but felt it is less, you can add 2 cups of baby spinach. If using normal spinach, you can add 2 cups finely chopped Indian palak too. Cook the spaghetti with enough water and little salt and few drops of oil. Soaking the spaghetti for 10 minutes makes it very soft and cooks quickly. Drain the water and keep it aside. Reserve 1/4 cup of the cooked water aside. We will need it later. Chop the garlic finely. Half the cherry tomaotes. You can use normal tomatoes too. If using normal tomatoes use 1/2 tomato. Chop them into slightly big pieces. In a pan add 1 tblsp of oil and add chopped garlic and the red chili. If using red chili flakes add in the later. Cook for few seconds and add in the cherry tomatoes. Half the tomato and add it to the pan. Cook for a minute and add in the olives. I added whole pitted olives. Add in the tomato puree and fresh cream. Add in the washed baby spinach. The spinach gets cooked in few minutes. Add the reserved cooked pasta water to this. Mix well. If adding chili flakes add at this stage. Once the sauce starts boiling add the cooked spaghetti. Mix well gently and evenly to get the sauce coated well on the spaghetti. If you want to add some grated cheese you can add now. 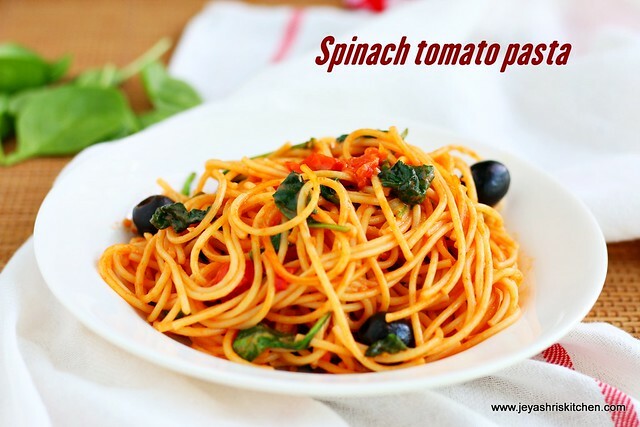 You can blanch the spinach and make it as a puree and add it after adding the tomato puree and cream. Adding cheese in the last makes it extra creamy. Looks yummy and healthy, thanks for the recipe, will surely try it, just one question i normally dont have fresh cream at home, what would be a good alternative for that? Grind paneer cubes with little milk and add as a replacement of fresh cream.